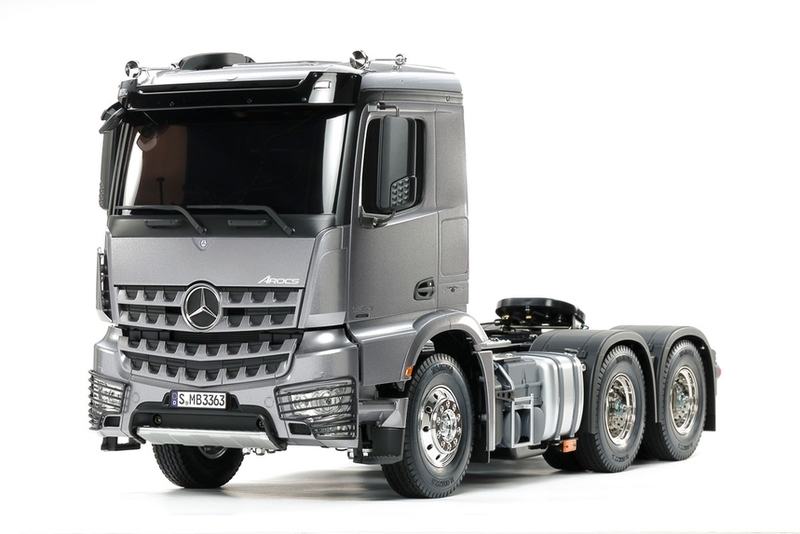 This is a special edition of the R/C Mercedes Benz Arocs (Item 56352), the super-stylish 3-axle truck with distinctive bucket tooth grille. It is a great option for those without the time or confidence to apply a paint job to their kit, as the cab, H, K, and M parts of the kit are pre-painted in Light Gun Metal (Tamiya Color TS-42), and given a urethane coating for a beautiful finish, and protection from damage. 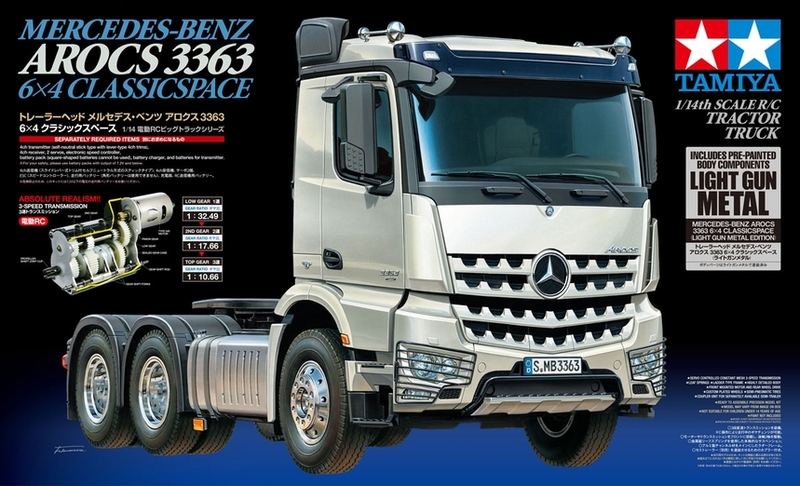 This 1/14 scale tractor truck recreates the Mercedes-Benz Arocs 3363 3-axle truck, which is the first narrow bodied European tractor model in the Tamiya Tractor Truck Series. The full-size subject is the German company’s heavy-duty tractor head that debuted in 2013. Powered by a 630hp 15.6-liter inline-6, the actual Arocs is capable of hauling massive loads of up to 250 tons. The Tamiya rendition faithfully captures the truck’s modern form with the use of ABS plastic body parts and a number of metal chassis components. One look at the detailed interior and auxiliary equipment, such as air tanks, will confirm that the body features replica-quality realism, which is further enhanced with metal transfers depicting emblems and numerous metal-plated parts. The chassis is built for durability as it uses aluminum side channels with resin cross members. Drivability is accomplished by power from the front-mounted motor and is transmitted via a propeller shaft to the rear axle; built-in differential gears guarantee smooth cornering. Gear changes can be made via a separately-sold Tamiya 4-channel transmitter. • 3-axle chassis utilizes ladder frame with aluminum side channels and resin cross members. Realistic drivetrain has a front mounted motor powering twin rear axle. Requires A 4-Channel radio, One Servo, ESC, 7.2volt battery with charger, and Tamiya TS-Paint.